Active Power can design and deliver innovative continuous power solutions for your traditional data center building. Start with highly efficient and reliable CleanSource UPS. Then add switchgear, generator, and other equipment from best-in-class partners to provide a complete electrical plant room. Or take the plant room outside with our PowerHouse continuous power solution and use that space for additional mission-critical IT equipment. Modular data centers can provide tremendous benefits in cost, delivery time and flexibility, and Active Power's offerings can magnify those benefits. PowerHouse's self-contained, plug-and-play design aligns perfectly with any modular IT system. If you're deploying a central electrical plant, CleanSource UPS provides an efficient, reliable and green backup power solution. f you're looking at a containerized data center – in an unused parking lot, a refurbished shopping mall, airplane hangar or even a custom-built shell building, then Active Power's proven ingenuity will really shine. We have deployed both standard PowerHouse systems and custom containerized electrical rooms for some of the most innovative and demanding containerized data centers around the world. PowerHouse is available in a series of standard systems from 240 kW up to 960 kW of critical power. The solutions are designed for maximum flexibility and scalability to support a wide variety of data center applications, enabling expansion of backup power infrastructure on demand. Systems include full paralleling support for larger applications. 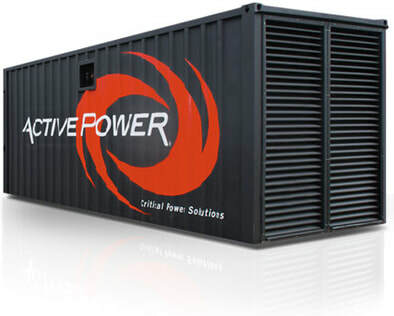 PowerHouse is a modular, portable continuous power system available for rapid deployment based on Active Power's high-efficiency and highly resilient architecture. The complete system is housed in a purpose-built enclosure and can be deployed in any number of locations - a roof, loading bays, secure compounds or even a parking structure. PowerHouse consists of six key elements, all pre-assembled and tested at one of our operations facilities and delivered as an integrated system.